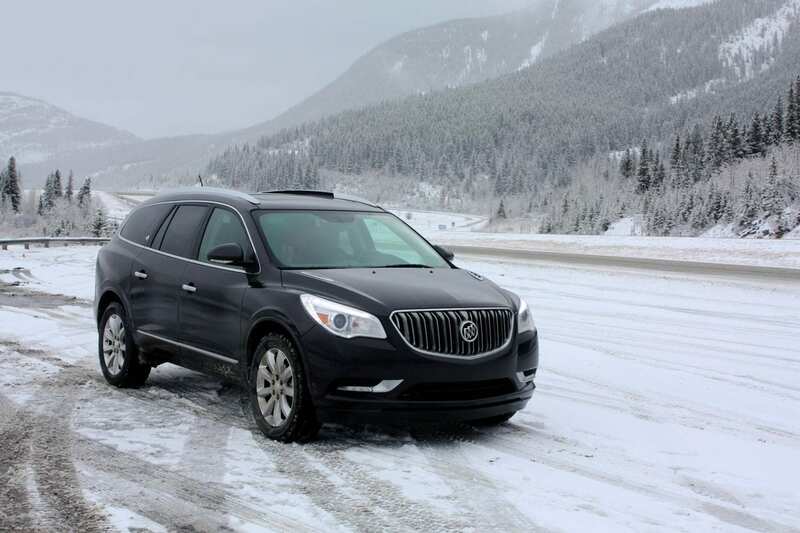 Buick’s big SUV shares its bones with several of its GM stablemates, the Acadia and the Traverse, but Buick really tries to set it apart visually, and in terms of the interior. I spent a week with this behemoth, and took my family on a road trip to the mountains with it. The exterior styling has evolved very slightly. 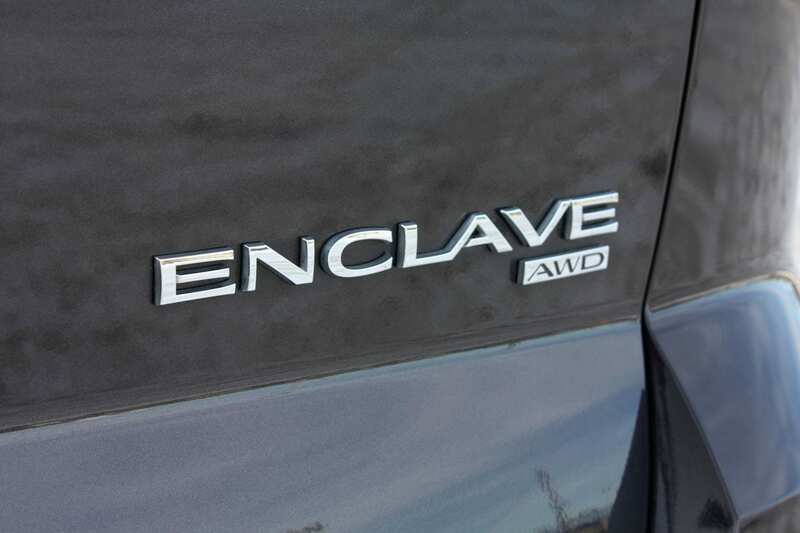 The Enclave remains a bulky SUV – it’s a stylish, curvaceous vehicle with a surprisingly short hood, tall sides, large greenhouse (that gets pinched toward the rear) and massive 20” wheels. 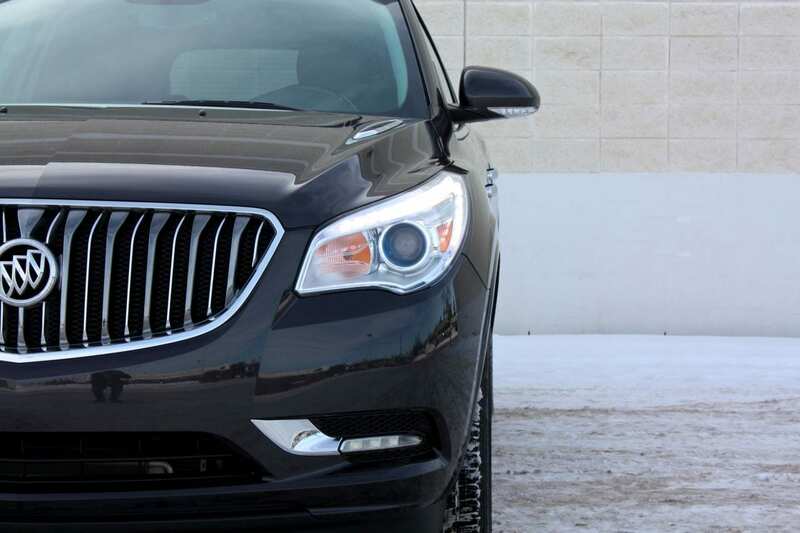 You can definitely count on finding the Buick grille here too. I’ve got a wife and three kids, aged 9, 5 and 2. So when we hit the road, we need some space. We need room for the people. We need room for the insane amount of luggage three females are capable of bringing with. And we need room to spread out, so that we don’t start beating on each other. With these needs in mind, I brought the Enclave home and set about packing for our trip. There are three rows of seating. The front row, beautifully appointed in perforated leather, was very comfortable for my wife and I. 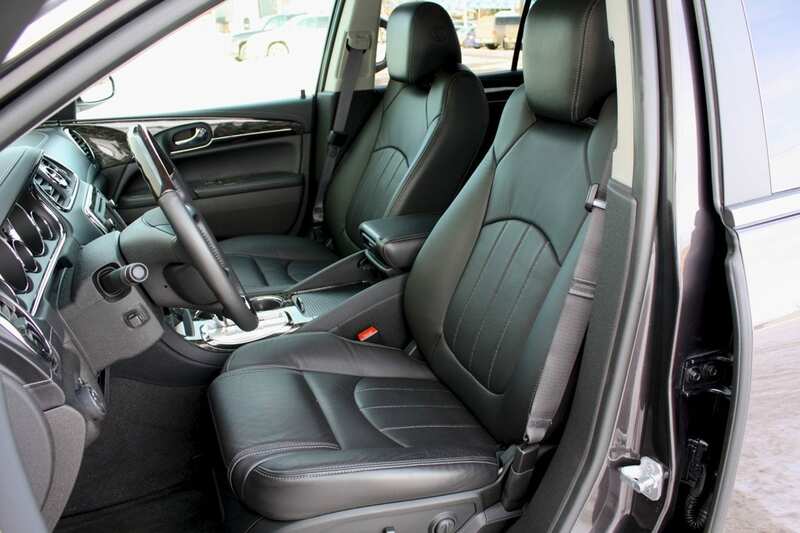 The seats are power adjustable, heated and cooled, and perfect for the highway. There’s plenty of space in every direction. 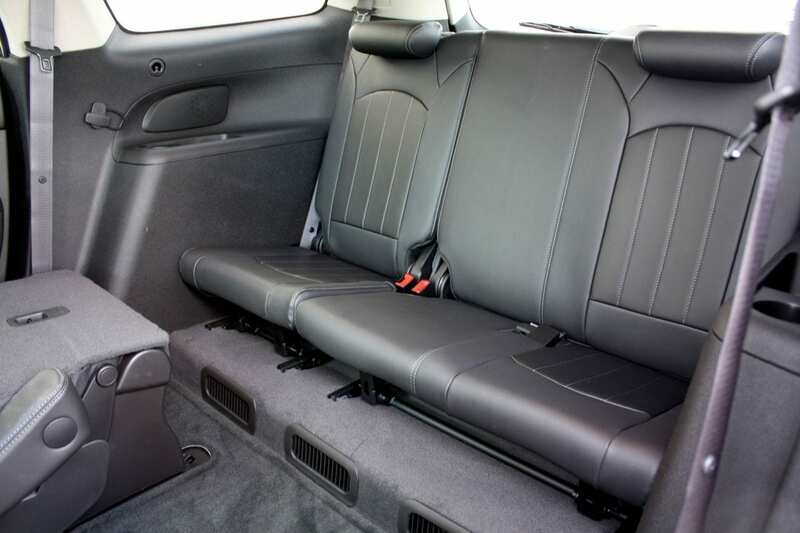 The second row is made up of two bucket seats as well. They slide fore and aft, recline and can also be moved out of the way – they fold together and forward, making access to the back row very easy. 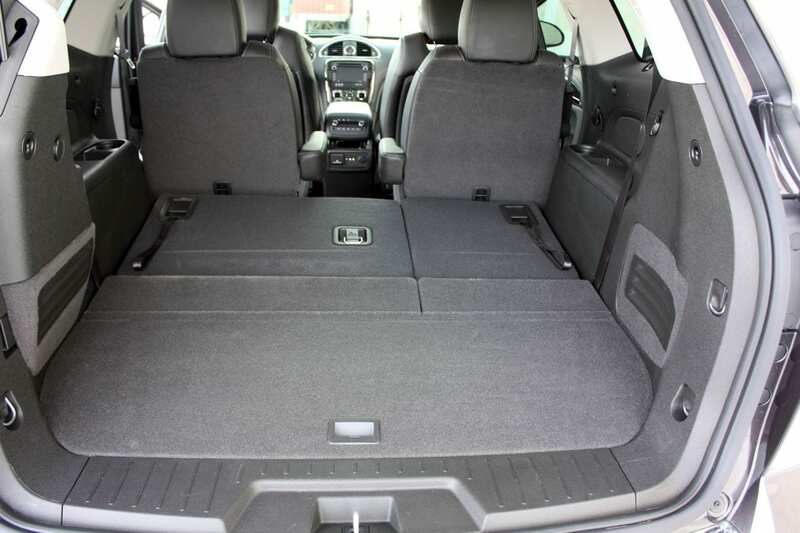 On that note, there is enough room between them, and a flat floor, and a kid would have no problem walking through to the back row, a la minivan. The second row is also comfy, and very spacious. The third row is a bench, made up of three seats. There are three seatbelts, and headrests for the two outside positions. My two older kids sat back there for the whole trip. And loved it. They had cupholders and storage cubbies and enough space. I tried sitting back there, and my 5’10” frame was not happy. At all. 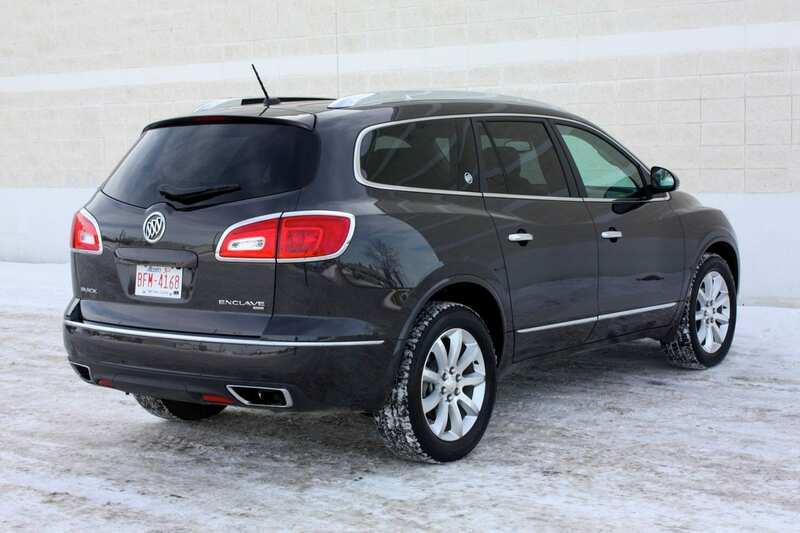 In terms of cargo space, the Enclave offers quite a bit. With the third row up, you have a decent 657 Liters to work with, and although it got stuffed full, it was enough for our little road trip. That third row folds down (splitting 60/40) – when both sides are folded out of the way, the cargo space becomes a 1912 Liter cavern. 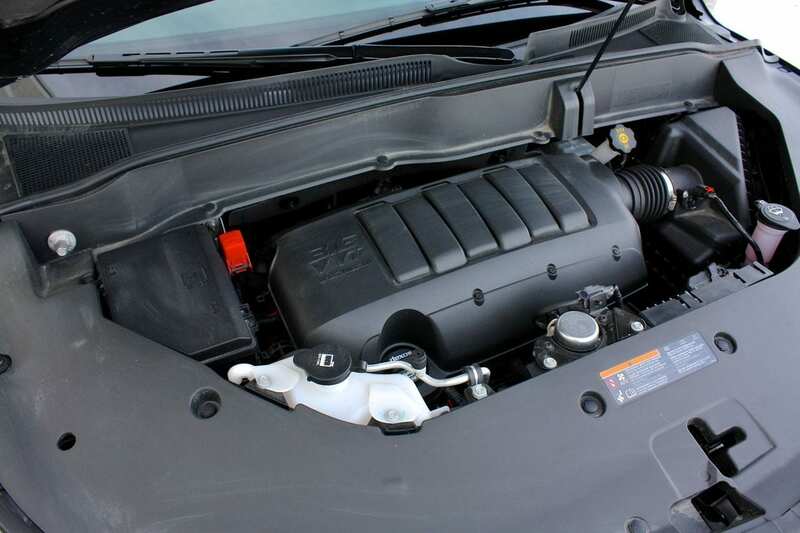 The Enclave is powered by GM’s 3.6 Liter direct-injection V-6. It’s a nice, smooth engine, and it puts out 288 horsepower at 6300 RPM. More importantly (especially when moving a 4922 pound leviathan like this one! ), the torque comes on quickly, and you’ve got 270 lb.ft of it available at 3400 RPM. 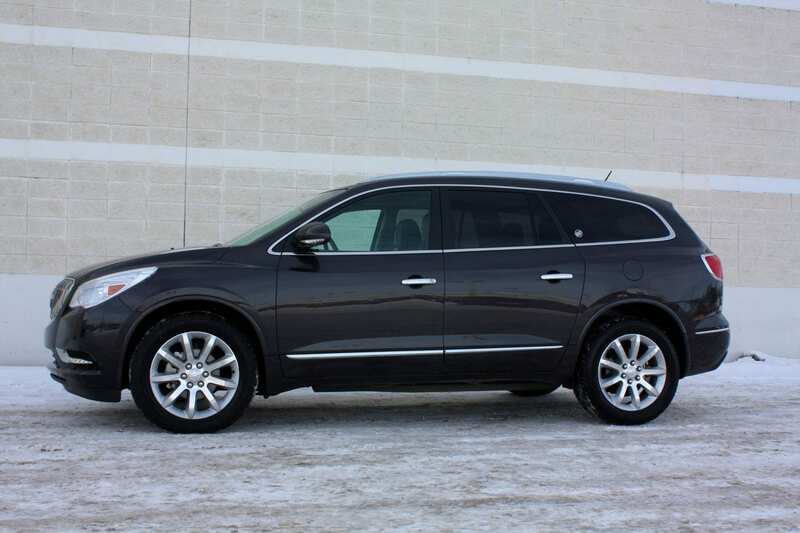 Around town, the Enclave feels powerful and jumps off the line. It’s never really a slouch, but you are also constantly reminded that you’re basically dragging the weight of two small cars around. Once you’re on the highway, passing takes a while – it’s not ponderous, to be sure, but it’s not nearly as fleet feeling as it is around town. I was very pleasantly surprised by the road manners of the Enclave. Considering this is a huge, heavy beast, the vehicle’s ability to negotiate any city driving situation is very good. Sure, there’s body lean, but not nearly as much as you’d expect. Sure it feels morbidly obese, but it still acts lighter on its feet than you would think. It handles well, all things considered. And once we hit the highway, we felt that we found this thing’s natural habitat. We left Edmonton and headed south. We loved the ride. It never felt squishy, and always came across as controlled. 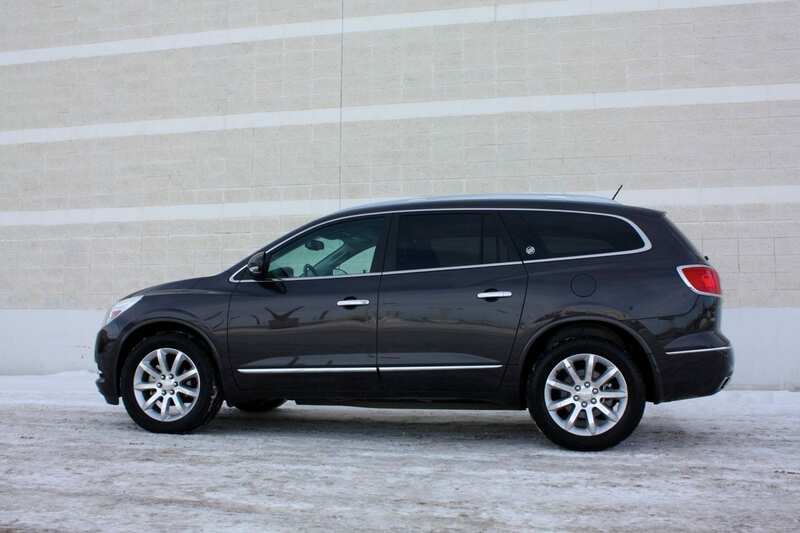 In the mountains, the Enclave handled any curves I threw at it, even at high speeds. Another thing we noticed on the highway was that everyone moved out of our way. 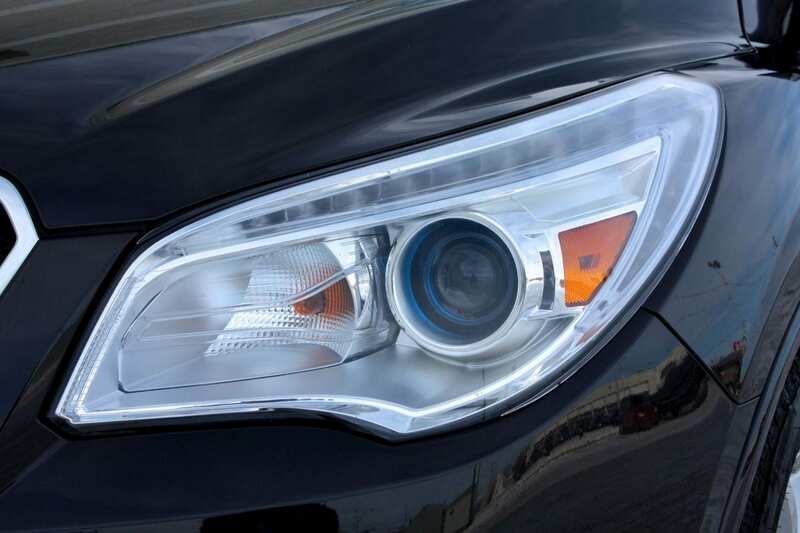 We attributed that to the massive silhouette with the aggressive LED driving lights that people noticed hurtling toward them in their rear-view mirrors. Our first stop was in Calgary. Our niece that lives there (Hi Sarah!) offered to spend the evening with our kids and so we put it out there on Twitter that we had a date night and that we were looking for good sushi. We got a ton of suggestions, but Globe Fish topped the chart. 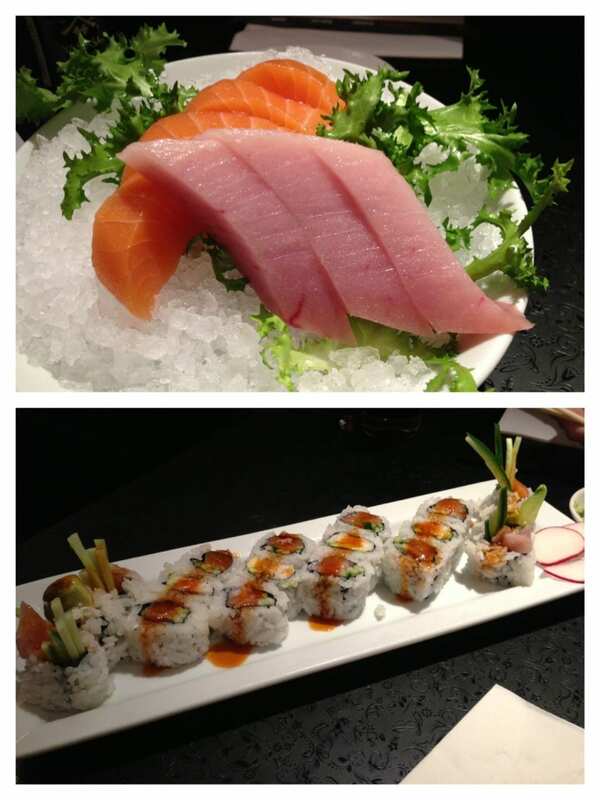 So we made our way to Marda Loop, and I can truthfully say the sushi we had there was the freshest, best prepared sushi I have had east of Vancouver. Highly recommended! We got hit with significant snowfall once we passed Calgary and started heading through the foothills and into the mountains. 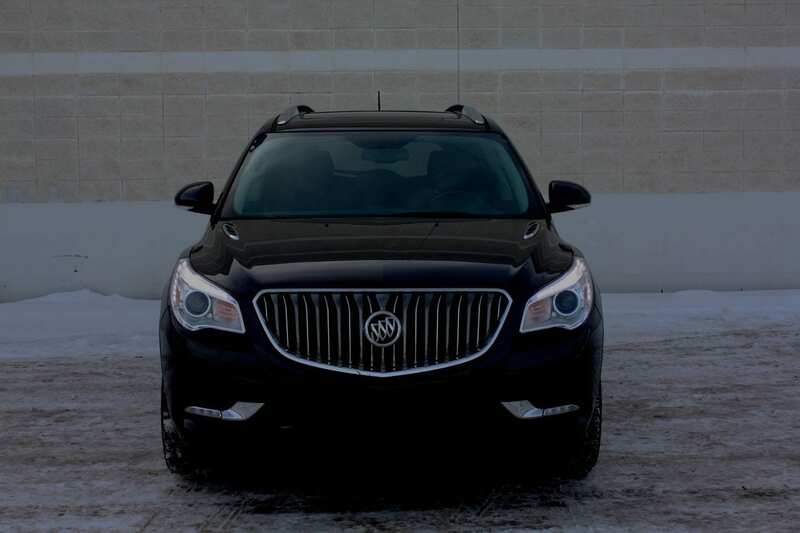 The traction in the Enclave was superb, and it never faltered. 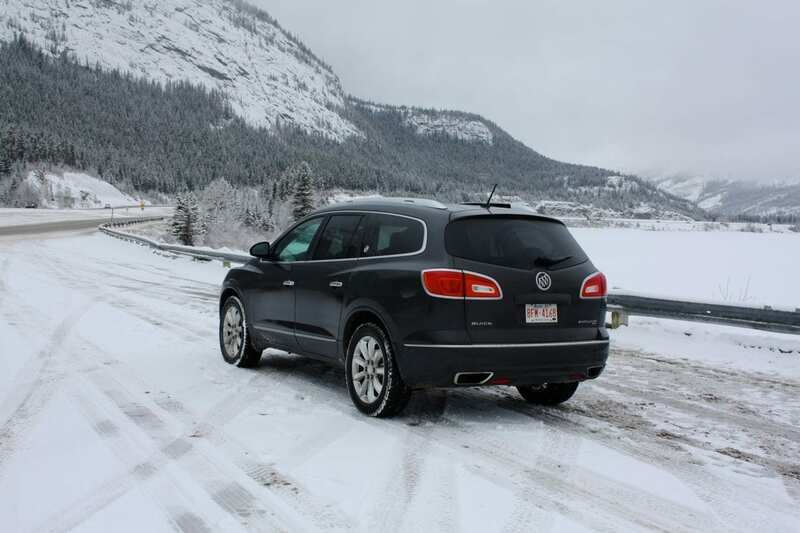 Even coupled with middling all-season tires, it never slipped at highway speeds and I was always confident – even in a blizzard. 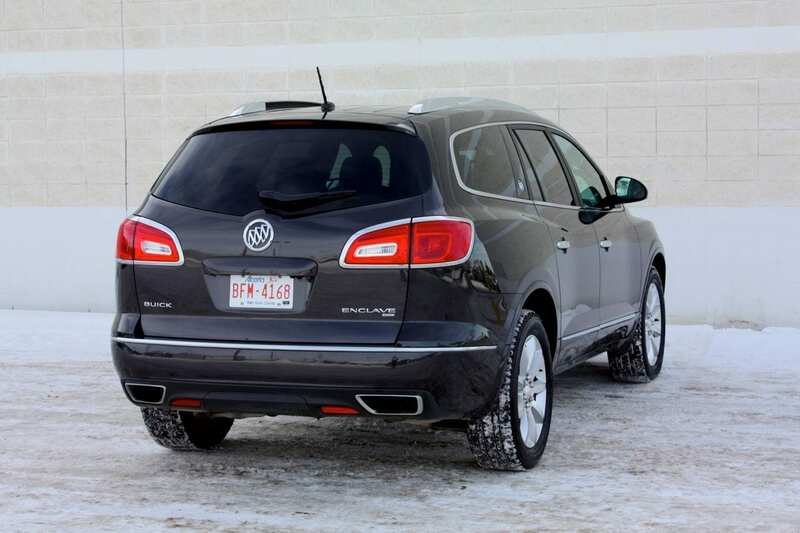 The all-wheel drive system is almost transparent during normal driving, and certainly does a great job when you need it. 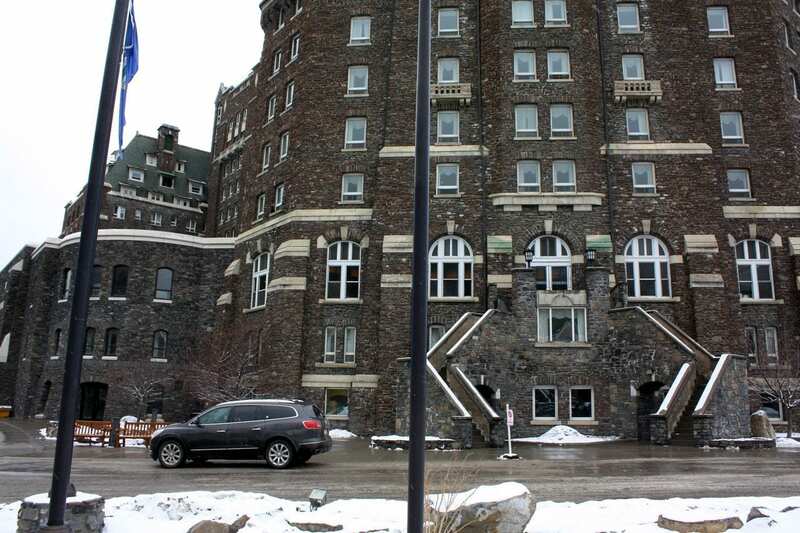 Once we reached Banff, we headed to our favorite digs, the Banff Springs hotel. If you’ve never been, put it on your bucket list. I’ve been going there since I was a kid, and it’s a magical place. Photo opportunities present themselves everywhere, there is a maze of hallways and passages – both above and below ground – to explore, with shops, restaurants and bars aplenty. There’s a ton of hiking and sights to see right around the hotel, and the hot springs (where you’ll pay too much, be too crowded, and won’t stay long enough) is just up the hill. A little adventure for you – I’ve been doing it for many years, and now I’ve passed the tradition on to my kids. 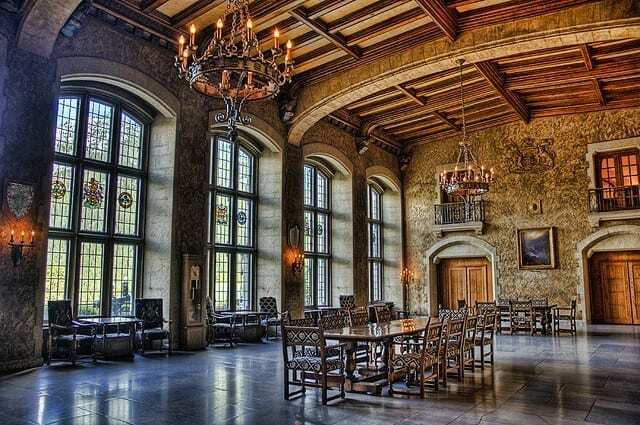 Pack some good wool socks, and make your way to the Banff Springs’ ballroom. Do it late in the evening, because you’ll find it quiet and abandoned. It often has furniture in it, but it’s sparsely placed, and you have room to move. Run as fast as you can, and enjoy the sock slide. It’s unparalleled. 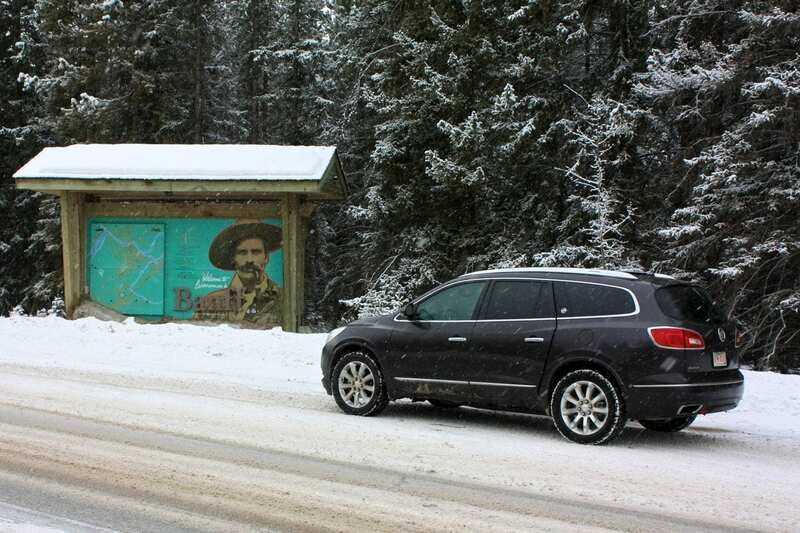 You’ll find another of our favorite stops a short drive from the Banff Springs. It’s the small, but beautiful Bow Falls. Though they’re mediocre in size, the spot is gorgeous year-round, and in the winter, our kids love to run on the ice. There’s plenty of parking here too. We made our customary stops on Banff Ave. As always, we had to drop into Evelyn’s Coffee Bar for a hot chocolate stop, and spend an hour in Welch’s Chocolate Shop, the craziest, most disorganized, most diversely stocked candy store that I’ve ever seen. And of course, we made our way to Mountain Chocolates, where candy apples are made fresh all day long. 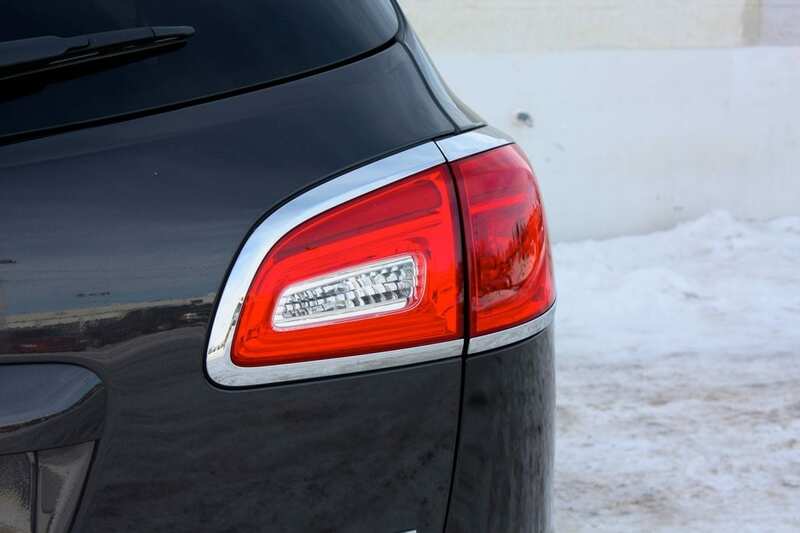 I certainly appreciated the parking assistance here, as the parking is at a premium and often tight – the backup camera and the parking sensors came in quite helpful. We also did our favorite hike, the Fenland Trail, just outside of the townsite. It’s a great family hike, because it’s only a couple of kilometers, but it’s a beautiful meandering trail under an old-growth spruce canopy over mostly flat ground (perfect for small kids). Our kids threw on their SnowStompers and away we went, through the lightly falling snow. Of course, plenty of shopping happened along Banff Ave as well – my wife can’t stop somewhere without benefitting from some retail therapy. Storage around the cabin is decent. There’s a little bin on the dash, which holds media devices and has a USB plug. You have a very deep bin in the center console, and there’s additional storage under the trunk floor. This is all good to know when your wife shops and buys as much stuff as mine does – especially if your ride is already packed full. Our last day ended with our other Banff tradition, an early supper at The Keg. The steak was fantastic, as usual. And with that, we bid our favorite Alberta mountain town a fond adieu until next time and got back onto the highway, carving our way through the national park, through Canmore, on to Calgary and back to Edmonton. 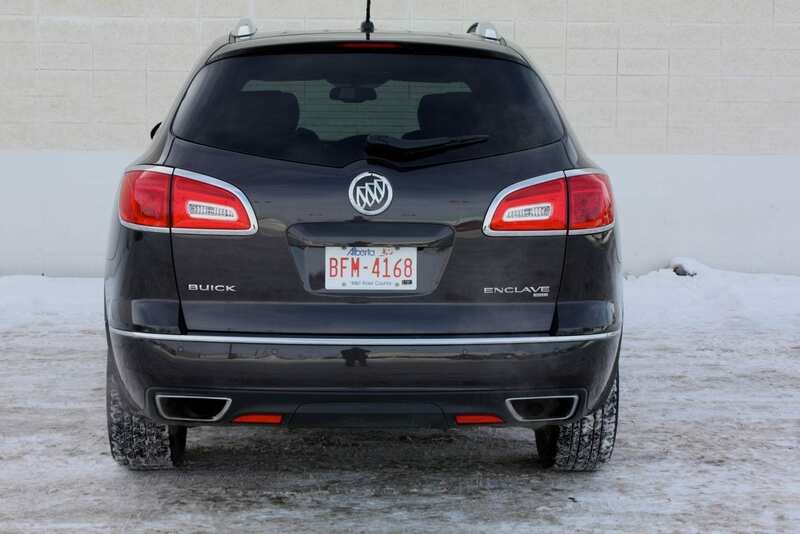 The Enclave’s fuel economy ratings seem reasonable – it’s rated at 13 L/100 km in the city and 8.6 L/100 km on the highway. Of course, nobody can ever achieve those ratings for love or money, and we averaged 12.2 L/100 km on our road trip, which consisted of around 900 highway kilometers. Which is relatively fantastic compared to the 16.2 L/100 km I averaged while driving around town. Don’t buy this vehicle if you’re an eco-weenie. Because you can hear the planet wilting every time you touch the gas pedal. 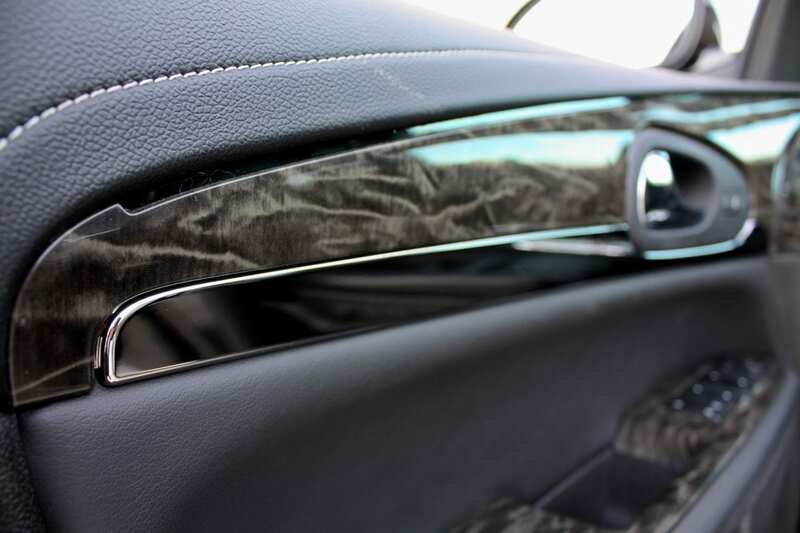 The materials in the cabin are lovely, and you’re surrounded by soft-touch fabrics and plastics, stitching and a stellar level of fit and finish. 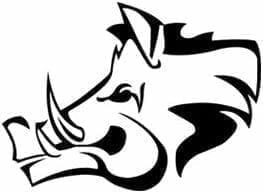 The entire vehicle seemed to be built well, with nary a squeak or rattle to be heard – even over some terrible rutted alleys and some light off-roading. 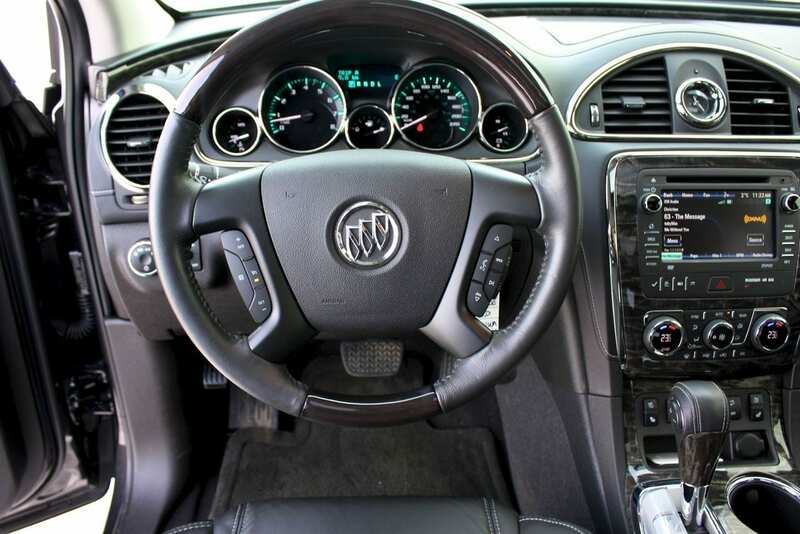 Buick’s Intellilink touchscreen system, which handles the audio, phone, app and navigation functions, is OK. I found the screen to be less responsive than I wanted it to be, but the user interface is relatively straight-forward. We were unable to input a destination address, and after failing at doing it on-screen as well as through voice recognition, I wanted to punch the system in the neck. We resorted to our iPhones. 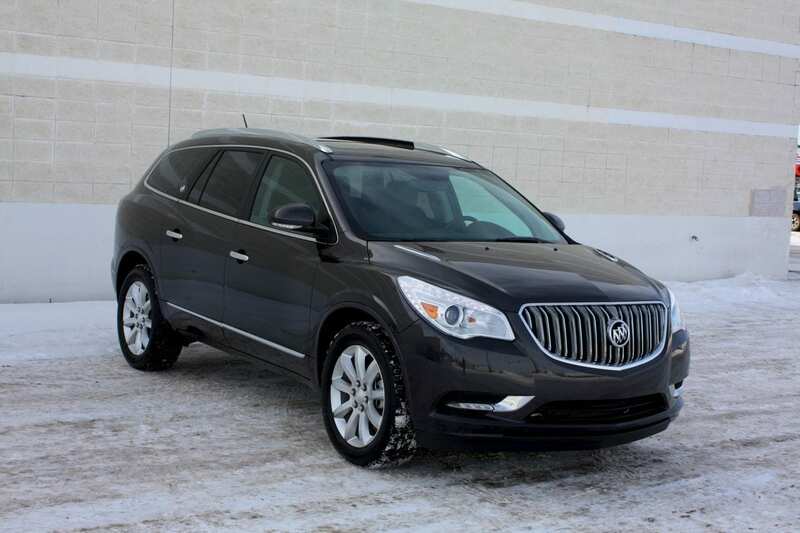 Being a rear seat passenger on a road trip in the Enclave is not a bad thing. 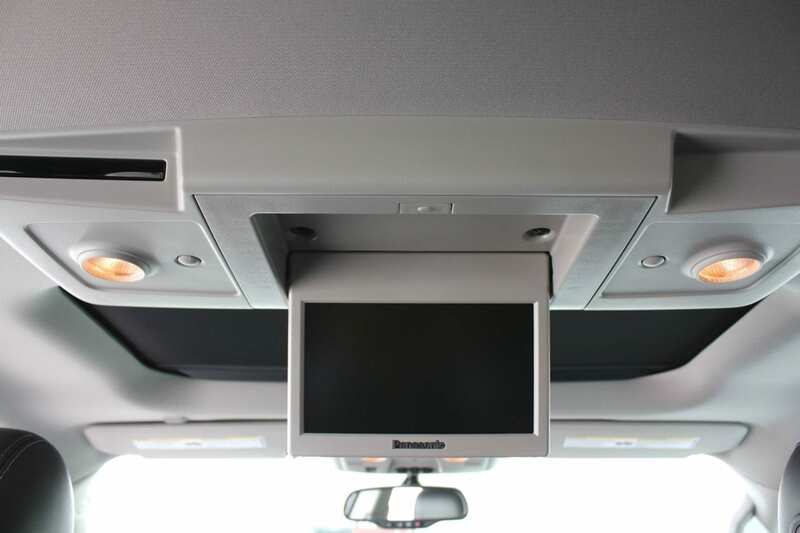 The seating is great, there is a rear-seat entertainment system with DVD player and screen, and there are controls for a separate stream of media back there. That’s all lovely, but I still recommend against the rear-seat entertainment system, regardless of the vehicle it’s in. They’re expensive and the screen flips down to block your rear view mirror. Get the kids their own iPads – which is what we did – and they can take it with them and do more with it. And you’ll save some money. Speaking of the view, visibility out of the Enclave is nice, except for shoulder-checking which is greatly hampered by the rear flanks that sweep upward and into your line of sight. 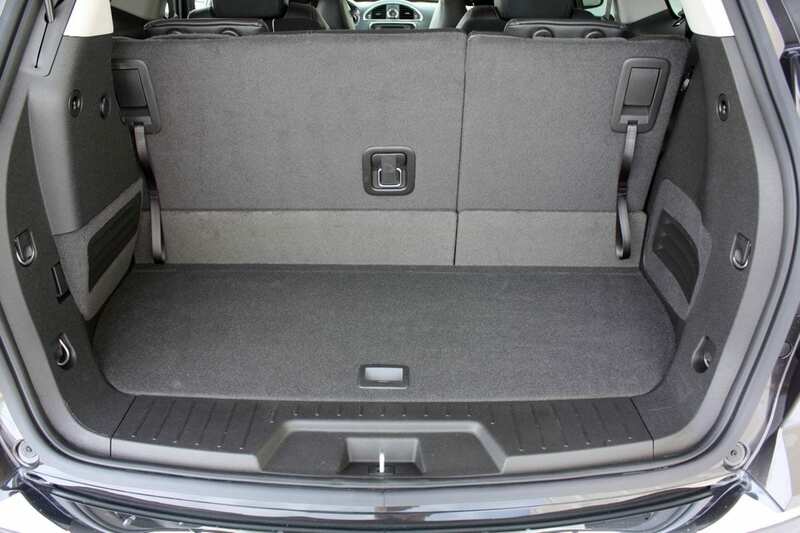 The powered liftgate is nice, and can be activated from the dash, the key FOB and a button on the liftgate itself. Yes, I said key FOB – firing this thing up is a real throwback, and you’ll use a key to do it. 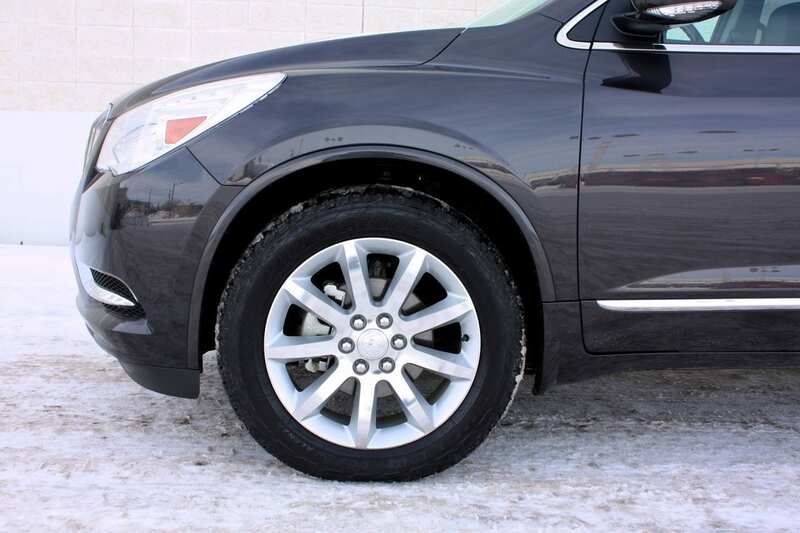 All in all, the Buick Enclave is a very nice vehicle. It’s pretty expensive, and at this price, I would have liked to have seen a few more things in the tech and convenience department. 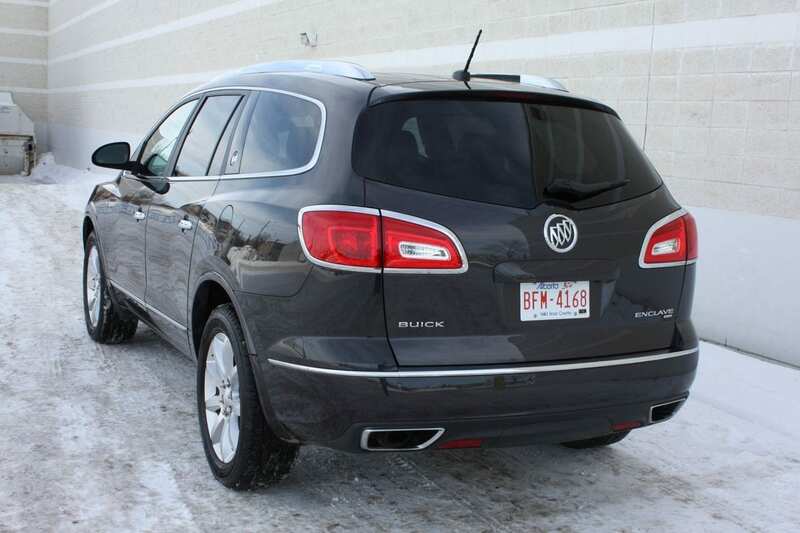 Such as heated rear seats, lane departure warning and front collision warning systems. But it comes well-equipped and dang, if it isn’t comfortable! 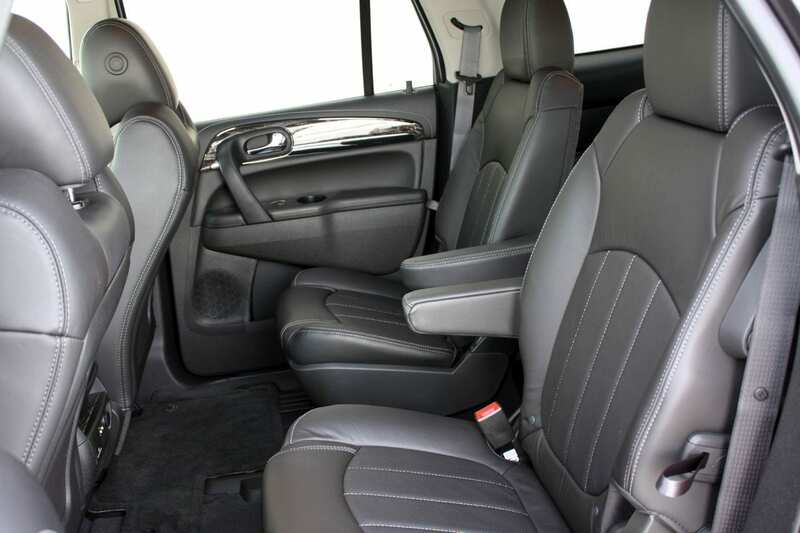 It’s a well-made, well thought out SUV that offers a lot of space, a ton of comfort, a solid set of goodies and handsome styling. And it did a bang-up job moving my family and myself during our road trip. Was it fun to drive? Heck no! But it sure coddled us in luxury and we were always comfortable. 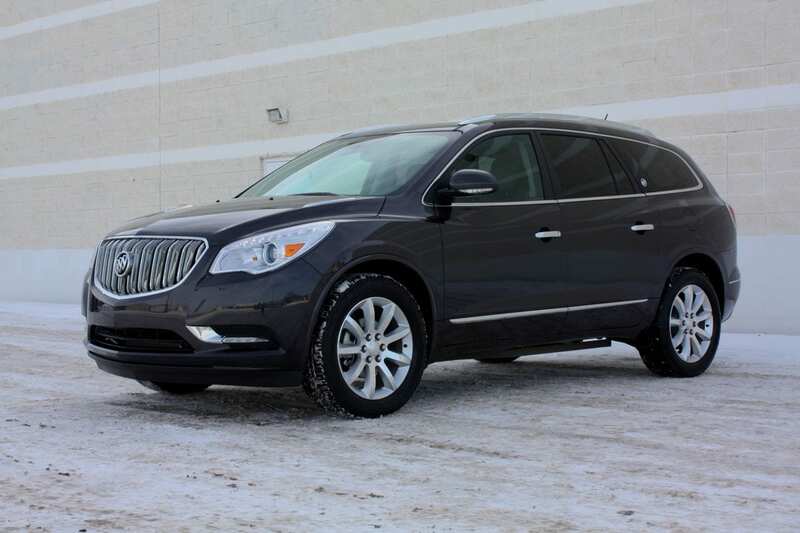 If this is what you’re looking for, and you need this much space, the Enclave might be the ride for you. 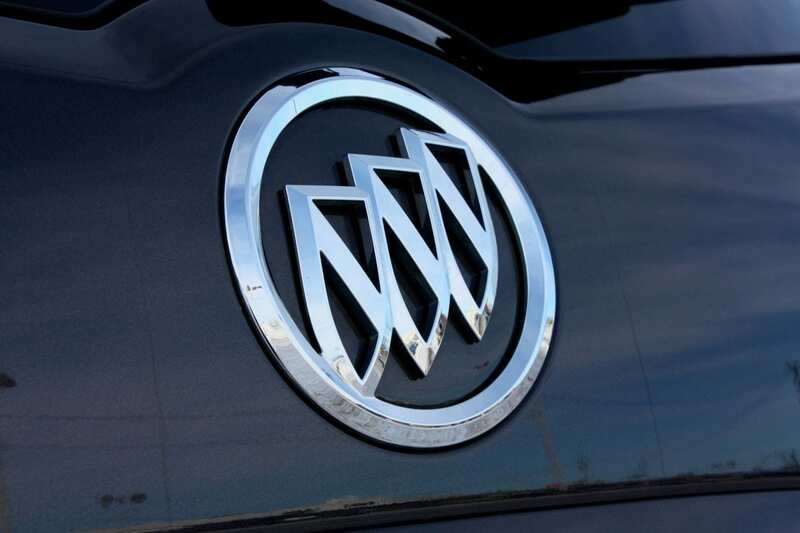 Disclosure: Vehicle was provided by GM Canada.